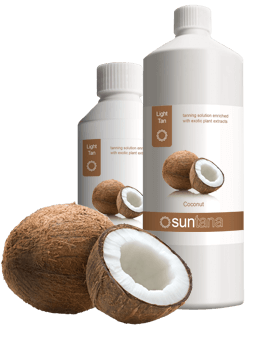 We stock a comprehensive range of professional sunless tanning products; available in natural shades which last longer, perform better and fade evenly. With distinct evocative fragrances, Coconut, Cherry, Chocolate, Blackberry and our Rapid Tan formula in Strawberry-Vanilla, you can look beautiful while stimulating the senses. Each fragrance has its own unique DHA strength, from Our lightest tan, Coconut, which is 8% DHA, right up to our deliciously dark Blackberry ‘After Dark’ tan with 14% DHA. Why does each shade have its own fragrance? 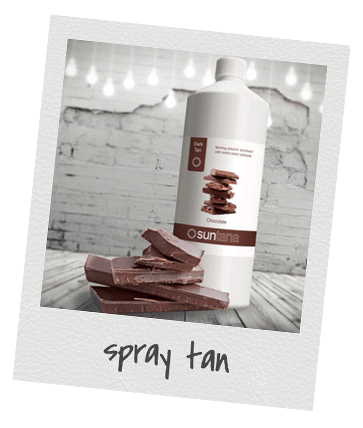 These days a busy spray tanner, whether mobile or salon based, needs to stock multiple shades, catering for customers with different skin types and preferences. Do you have some product still in your gun from the last tan and didn’t have time to clean it out? No more wasting generic products that all smell the same, just take a sniff our gorgeous scents and you will immediately know what shade it is. Your clients benefit too, repeat custom has never been so easy. They’ll remember the fragrance from the last tan, far easier that trying to recall what shade they had! Whether you are looking for lovely sun kissed glow or a deep bronzed tan, our spray tan will give you a convincingly natural result without exposure to harmful UV rays. Close your eyes and imagine the Hawaiian breeze. Enjoy the lollipops n’ lipstick scent of freshly picked cherries. Chocolate – Need we say anymore? Try the seductive aroma of blackberries! Look gorgeous in a flash when you’ve got to dash!